I’m thanking God in a very special way today for my mom and dad: Today is their Golden Wedding Anniversary! Jules and Margaret Damiani were married on this day, December 26, 1964. I am truly grateful for their faithfulness to God and to each other. They are a blessing to me, my siblings, and to so many others. 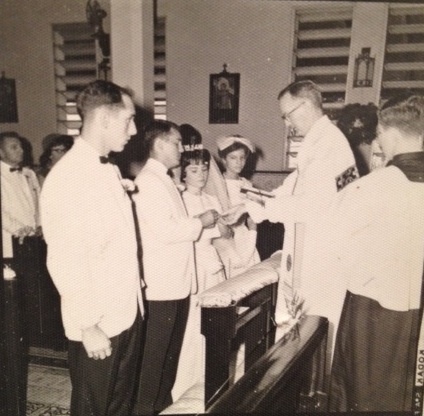 Thank you mom and dad for your “yes” fifty years ago and everyday since then – love you! Please join me in praying for them, and for all married couples, today. May our dear Lord grant you much joy, and continue to deepen your love for each other May He bless you and your family, and lead you both to Heaven. St. Stephen, pray for them. This entry was posted in Uncategorized by srmarypeter. Bookmark the permalink. Beautiful picture! Wishing your parents many blessings!